Week 15: DB close gap as Forward draw while Bants lead Div two. The race to be crowned Division 1 Champions took another twist this at the weekend when DBFC narrowed the gap to 2 points. Playing in their familiar late afternoon / early evening slot, DB ran out 3-0 winners but were made to battle by a Corinthians side who had picked up 4 points in their last two games to drag themselves back to within touching distance of the pack. DB created a number of early first half chances but needed to wait till later in the half to take the lead when veteran Scotty Holmes broke the deadlock. Into the second half Jordon Brown notched a couple to take the game away from Corinthians who would be ruing a missed opportunity to capitalize on the small squad DB had as they had many players missing themselves. Forward drew 1-1 with Mes in a game which kicked off 25 minutes late due to the Mes kit being stuck in traffic. Forward took the lead when Silvio Ruprah scored his 2nd goal in 2 games since making his move from San P’s but the league leaders were pinned back in the second half when Rob Barret squared things up. Further controversy surrounded the linesman with both managers commenting they were atrocious but no details provided for this report. USRC ran out comfortable winner over San P’s who now find themselves 6 points adrift from Corinthians having also played a game more. Once again however it was a close game and if San P’s had managed to covert some of their good chances it could have been a different story. The match ball went to Marcello Vastolla who notched a hat-trick with Adrien Lau also getting on the scoresheet with a conciliation Rob Johnston strike for San P’s. Coming off the back of 2 league defeats Club Tropicana picked up a crucial 3 points against 4th placed J-Leaguers. Tropics got their noses in front within the first 5 minutes when Kyle Wagner got on the end of a corner. J-Leaguers pushed Tropics back thereafter and had much the better play for the next 15 minutes and equalized when Yasumasa Miyauchi hit a low volley through a crowded penalty box into the bottom corner. This spurred Tropics on and Captain Paul “Pony” Ryding put his team ahead once again getting his head onto a free kick. Once again J-Leaguers pressed but a few crucial saves from the ever young Stef Fuchs kept the score 2-1 at half time. Further goals from Michael Gee and James Manning meant Tropics closed out the game 4-1 victors. In Division 2, after being at the top for most of the time since the start of the season, Vikings were overtaken by Bants when they lost to Shooters 0-1, who had Shinichi Kudo score the match-winning goal. Bants capitalized on this slip by Vikings to move to the top after beating TWF 4-1 convincingly. TWF again had a slow start like in previous matches and they soon found themselves down by 2 goals by the interval. After the break they made some substitutions which took effect immediately and they gained back much of the possession. Their efforts got paid off finally when Fung Chan scored to shorten the deficit. TWF geared up the pressure to look for an equalizer but Bants withheld the pressure and scored two more goals towards the end of the match to seal the victory. Lee Hodgson delivered a brace of goals for Bants while Alexis Devaud and Robert Gibson both scored a goal each. Revolution remained a contender for the title when they moved to 5th place after thrashing BOC 7-0. “Solid performance from the Revo today, and with better finishing could have had a few more ,” said their manager Paul Snelly. Chris Marshall was their hat-trick hero while Brian Gillot, Alessandro Tomella, Tim Rechter and Terry Graham all put their names on the score-sheet too. Another goal rush was seen in the match-up between Legal Head and Young Guns. 1 goal apiece for Gurang Misal, Niranjan Limbu, Charles Reid, Josh Mak Sai Yu, Amin Ashraf and Limbu Versaj built up a 6-0 victory for the Legal Head. Young Guns, playing with 10 men, delivered their greatest efforts to give the opponents some nervous moment but game was settled after the second goal, and a few late goals flattered the score line. Old Speckled Men beat Samurai Blue 2-0 relying on a brace of goals from their playmaker Amro Abbas. 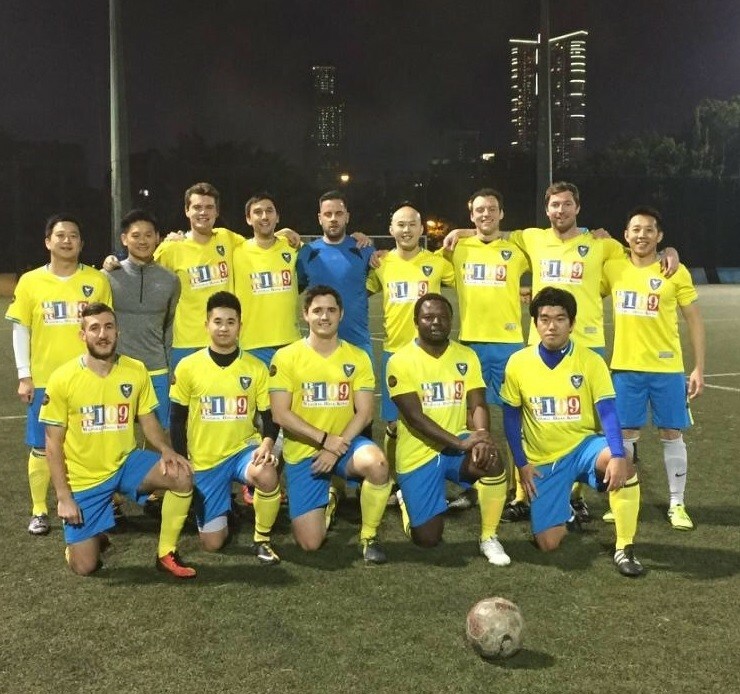 Shui Wei outclassed MBFC in their 6-1 victory. Luke Facer and Seth Moses both scored a brace while Eric Keck and Julien Aouicerate both found the net once to add up the tally. Soobratty Devin was the scorer of the consolation goal for MBFC. On Monday night, both KCC teams recorded a 0-3 loss at home. Cavaliers hanged on till the last 20 minutes when Nick Dashti, Rudi Willemse and Robbie Lunn scored to secure the victory for Soho Spartans. Team Shotgun on the other Kings Park pitch beat Royals with the same score. It was goal-less in the first half but Ryan Lee, Ambrose Wong and Henry Shek all hammered once in the second half to put their team into 2nd place and they are also one of the title contenders.